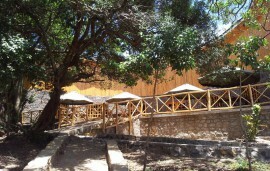 Entim Mara Camp is right in the middle of the very best game-viewing areas. 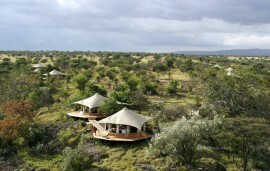 From the shaded seclusion of this attractively-designed camp, guests can relax in luxury and admire unforgettable views over the Mara River and across expansive plains, with the distant backdrops of undulating escarpments and volcanically-sculpted hills. This eco-friendly camp has been kept small in size to ensure maximum privacy and exclusivity. 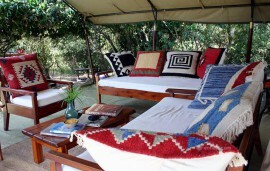 Entim meaning “forest” in Maasai is discreetly tucked on the edge of the riverine woodlands. Entim Safari Camp offers ten eco-friendly well equipped tents en-suite with flush toilets and hot showers that accommodate guests in utmost comfort, amidst breath-taking scenery. Each of the luxury en-suite tents is individually decorated to provide the ideal blend of color, texture and ambience; and each has their own large, secluded verandah. There is a cosy lounge area with a small library, separate bar and dining area, which is open-fronted allowing guests the unmatched experience of eating meals while watching the animals move to and from the river to drink and forage for their food.